We all know couples that just “work.” One person might be a talker and the other a listener. One might be flaky and the other one more organized. Whatever it is, successful couples are often complementary. The same goes for food. One element plays off the strength of another, making it a winning combination—a power couple, if you will (think peanut butter and jelly). Below are 5 fantastic food pairings that play well together. Stick with these and you’ll never be disappointed. Pork has a mild, unobtrusive flavor. It does well with anything that can give it a little jolt. However, the best pairing is with apples. Apples aren’t particularly strong flavor-wise, but they deliver both a sweet and slightly sour element that works well with the mildness of pork. 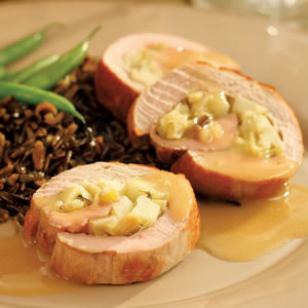 Apples are meltingly tender when cooked, which is a nice complement to roasted pork tenderloin or chops that are more savory and mild. It’s like the relationship that houses both the introvert and the extrovert. The pear is the introvert. Its flavor is sweet, tender and low-key. The blue cheese is the extrovert. Its flavor is pungent and demands attention. The pear tames the blue cheese and the blue cheese elevates the pear, making them perfect for pairing on a salad or even as a topping for pizza. Everyone at some point or another has had beans and wieners. The dish’s popularity probably stems from convenience—open a can of baked beans, add chopped-up hot dog (wieners) and you’re done. But it wouldn’t have been so successful if it didn’t taste great, which is why I’ve included it here. Why is it so good? Baked beans are sweet. And they’re excellent paired with anything salty or a little bit smoky, such as hot dogs or sausage. I don’t think I’ve ever eaten fish without a squeeze of lemon. Fish that has a mild flavor can be drawn out with a little acid. And it works well for oily fish that tends to have stronger flavors, such as salmon and sardines. The lemon can “cut through” the fat, striking a perfect balance of flavor. Lemon is the perfect complement because it’s sour, but not too sour. Other sour foods, such as vinegar, can overwhelm fish, but a squeeze of lemon gives you just the right amount of tang. Perfect pairings don’t always have to rely on opposites. Take the marriage of beef and mushrooms, for example. Both have a savory flavor and together they offer a much richer flavor than they could on their own. That’s thanks in part to umami, the fifth taste (after sour, sweet, bitter and salty) that is often described as savory, brothy or meaty. Putting your finger on the taste of umami is difficult, but it’s common in mushrooms and beef—and is part of why they taste so good together.